March 3, 2011 – Every year when you read the newspapers the next day after signing day, you read about the Division 1 schools signing classes and the IAA signing classes, but you never hear about D2 or D3 classes. 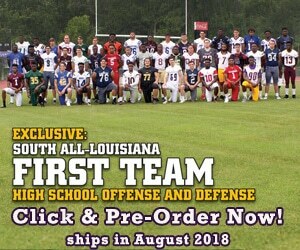 Louisiana College falls into that category because it’s a D2/D3 School for Football and it’s illegal to get a quote or anything from the coach because kids that go to Louisiana College and other D2 or D3 schools have different rules than DI and IAA schools. The rule is that they can’t be quoted until the kid enrolls at the campus. So I took it upon myself to write about Louisiana College’s Class, from some research out of state with connections, and knowing the kids they took in state. Louisiana College signed some players that could have gone the IAA route very easily and some of these kids are as good as some of the IAA signees in state. QB Shawn Hoye who I wrote about in my Heart of Champions page on the site had as good of an arm as any QB in Louisiana for the 2011 class, but he was passed over because he stands only 5-10. But hey Doug Flutie was pretty good at Boston College, and so was Stefan Leflors (5-11) at Louisville. I saw Shawn play many times and he will be a big time player at Louisiana College. OG Brandon Porche (6-3, 280) from Westminister in Opelousas, Louisiana, could have signed with many IAA teams and chose Louisiana College. This kid has good feet and is very strong. D’Sean Morrison (5-10, 175) was an all everything athlete at West Feliciana High School and runs a legit 4.5/40, and could be playing on Sundays one day as a DB or Slot WR. Darren Harrell (6-2, 360 pounds) played DT for Marksville High School and moves like he’s 260. If he loses just 25 pounds he could dominate in time in that conference, and I’m sure Head Coach Dennis Dunn will get him there. Finally I love the two out of state players signed. One is Jordan Chenier, the 6-3, 285 pound OG /OT with great feet, and Texas Strong from Needville High School in Texas. There’s also Tyler Norris, the 6-4, 265 OT from Gordo, Alabama. He has great feet and good hands for an Offensive Lineman. I take my hat off to Head Coach Dennis Dunn and Staff, with almost a zero budget in recruiting signing 6 to 7 IAA legit players for a D2 –D3 school .